Andrew Nicholas Barron died peacefully at his mother's side on September 29, 2004. This page remains as a testimony to the powerful way God worked in his short life. Terri Palmquist also wrote a poem telling Andrew's life story. God answers prayer! Keep praying for baby Andrew! God has given us the great privilege of being tools in His hands, ministering to people with His power. Yesterday, Terri and I sensed that baby Andrew (the newborn son of one of our clients) needed a special touch from God, so we decided to travel to the Children's Hospital of Central California north of Fresno to visit Andrew. 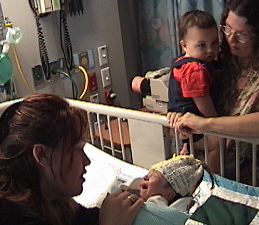 Terri Palmquist holds baby Andrew (this photograph was taken the day before Andrew was hospitalized). Andrew was hospitalized just a few days after his birth due to meningitis caused by a beta strep infection he acquired during delivery. The meningitis caused Andrew to suffer from over a dozen seizures an hour, which according to the doctors severely damaged his brain. Andrew's seizures have been controlled by phenobarbitol, which put his brain to sleep. Over the past two weeks of his hospitalization, an increasing number of people from as far away as Poland have been praying for him, asking God to heal his tiny body. On May 17 at the Kern Region Prayer Watch, the Christians who were gathered together for prayer from around Kern County claimed God's purpose for Andrew's life. The praying Christians were connected by phone with Jessica, Andrew's mother, who was at Andrew's side in the hospital. Terri and I remembered how God worked in the life of our first child, also named Andrew, who was hospitalized for 10 days after his premature birth. Although the doctors had told us of many problems Andrew could experience, today Andrew is a healthy 18-year-old and a worship leader! We couldn't help but see our Andrew's past struggles and future victories in the face of this new little Andrew. As prayer continued over the next few days, Prayer Watch leader Susan Rowe discerned the need to "break an assignment of witchcraft over the family and pray for repentance that will lead to salvation." Jessica later confirmed the validity of Sue's insight, explaining to Terri that members of her family (other than herself) are involved in satanic activities such as psychic activity, palm reading, and drug abuse. This Monday (May 24), Terri brought baby blankets to the Kern Region Prayer Watch meeting, asking participants to pray over the blankets. Terri did this as an act of faith, remembering what God had done just a few weeks ago in the life of a woman who was suffering from advanced stages of throat cancer. A scarf was brought to the Prayer Watch meeting to be prayed over, and the woman wore the scarf as an act of faith. Later, two different doctors reported that all signs of the cancer were gone. At Terri walked into the prayer room, one of the participants told Terri that her daughter in Minnesota had said that we should pray over a baby blanket and bring it to baby Andrew. One of the most significant moments of that evening of prayer and worship for me was when we sang to God "I'm desperate for You," confessing that He is all we need (and all Andrew needs), He is "the air we breathe." As we prayed over the blankets, one word kept coming to my mind: "glory!" I prayed that God's glory would fill little Andrew, and expand to his family, the entire hospital, and beyond. We sensed God's glory filling the prayer room that night, as He filled our hearts with joy and laughter echoed through the room. After the prayer meeting, Jessica called to tell Terri that baby Andrew's condition was declining; a nurse even insinuated that he might not make it through the night. Although it was after midnight, Terri at first considered driving to the hospital immediately. But Tuesdays are abortion days in Bakersfield, so she wanted to ensure that the pregnancy evangelism outreach to the women entering the abortion chamber would not be neglected. Before the sun rose on Tuesday morning, Terri called the hospital to check on baby Andrew's condition. A nurse pessimistically told Terri that she had never seen a baby in his condition who fully recovered. "But," she quickly added, "that's just one nurse's opinion." perimeter of the abortion mill's property, praying as she held the blankets, remembering that the night before we had claimed Christ's victory not only over Andrew's sickness but over abortion. Terri spent several hours on the sidewalk outside the abortion chamber, reaching out to the women who were being led into the devil's snare. Terri was met with an unusual amount of hostility, but she recognized that this reflected the intensity of the spiritual battle at hand. Finally, Terri's replacements arrived and we were able to hurry to Fresno. When we arrived at the Children's Hospital, we thought we were late. But Jessica soon walked up pulling her two young boys in a wagon, and she said our timing was just right. Jessica was upbeat, thankful that someone who had been trying to discourage her had been removed from the situation (this person has a witchcraft-oriented background and was causing trouble for Jessica by practicing deception, so we considered her departure to be an answer to prayer). Soon we were in the PICU (intensive care unit). "I don't want to scare you, but he looks really bad," Jessica said. (That was the most negative thing she said all day.) But our experience with our own baby Andrew had prepared us for what we were about to see. As I anointed Andrew with oil, I proclaimed that Andrew's Creator was also his Healer. I repeated some of the prayers which had been proclaimed by those who were at Monday night's Kern Regional Prayer Watch meeting, including the declaration that the healthy cells in Andrew's body would have a sevenfold increase. I also prayed again that Andrew would be filled with God's glory. We placed the small prayer cloth over Andrew's head (it was later moved to under his head), the small baby blanket at his feet, and the larger baby blanket at his side. The larger blanket was one of the special blankets made by some ladies at a local church, embroidered with the words "Jesus Loves Me." After our prayer time, I went back out to watch the children, leaving Terri and Jessica in the room with Andrew. Jessica was expecting a visit from the doctor soon, and she anticipated the doctor asking her the dreaded question, "do you want us to shut off the life-support machines?" Jessica had prayed that someone would be at her side for support during this meeting with the doctor. When the doctor finally arrived, Terri assured the doctor "we're praying for a miracle." The doctor responded with silence. When the doctor emphasized many of Andrew's problems, Terri responded confidently, "no offense, but the worse it looks, the more obvious it will be that it wasn't you guys who healed him!" The doctor agreed. Even in the face of the seemingly insurmountable problems, there was some good news to report: Andrew was being removed from phenobarbitol, the drug which was putting his brain to sleep. This would be a key time for him, as his brain was given the opportunity to wake up. At the end of the long day, we went with Jessica to her room at the Ronald McDonald House, which shelters families of hospitalized children. Terri was hoping we would have an opportunity now to pray with Jessica to accept Jesus as her Lord and Savior. Several times over the past few days, Terri had begun talking with Jessica about her spiritual condition, but it never seemed like the right time (for example, a nurse interrupted one such conversation by walking into the hospital room). But in the privacy of Jessica's room, we finally had the opportunity to help Jessica repent of her sins and fully accept Christ's payment for her sins, and His plan for her life. Jessica, eager to meet her heavenly Father, never hesitated. With tears of joy, we said goodbye to Jessica and her boys, and headed back down the long road to Bakersfield. Today (Wednesday, May 26), Jessica called to tell us that the doctor had great news. He had tested some of Andrew's reflexes, and had noticed some response. "Now this is what we're looking for!" the doctor exclaimed. Andrew continues to experience seizures, but they are about 25 times less frequent. "We can handle this," the neurologist said. The wrapping around his head has been removed to let his head air out for a while. As Jessica walked down the hospital's hallways after meeting with the doctor, she lifted her voice in praise to God. She wondered a bit if someone passing by might think she's crazy, but it didn't matter. Her heart was so full of joy and praise she had to let it out. We give all the glory to God for healing Andrew, and we continue to covet your prayers for him as there is still a long road ahead. And we join with the angels in heaven rejoicing over Jessica's salvation! Thank you so very much for your prayers for little Andrew. He keeps improving every day. I just got off the phone with Jessica (Andrew's mom); they are weaning him off the respirator. We would like to ask you to pray that God would make him be able to cough so that he will not need to have a tracheotomy in order to get the gunk out of his lungs when he goes home. He has slowly but surely been showing signs of improvement in the response department. He opens and closes his eyes, he yawns, and he moves his hands and feet! Pretty good for a little guy who has only 20% brain function left (according to the doctors)! The doctors have said he won't have "much of a life" and that is "If" he makes it! They are now saying "We didn't expect this much from him!" One nurse has started playing lullabies for him. The next chance I get to go to Fresno, we need to bring some worship music! This hospital is never going to forget little Andrew and the miracles God has done in his life! Please pray that God will bring to life those "dead" cells and that he will be a walking healthy testimony of God's love and power. Jessica believes that this has been a test of her faith. When her family and medical community were telling her that she should give up, and plan her baby's funeral, she refused! She has always believed that Andrew would get better and she feels that God is happy with her and that she passed the test. One of Jessica's family members (who has been pretty negative) has now bought the baby three new outfits and has told Jessica that she is proud of her because she "kept the faith" and "never doubted God" throughout this whole time. There have been so many neat little improvements the last week, I can't even remember them all, but hopefully you can get an idea of how God has amazed us and how excited we are as we look toward the future and the life He has for this amazing little fighter. Glory to Andrew's creator and healer! This morning is a very important time in Andrew's life. He is expected to be taken off of the respirator! This is the last real "life support" he is on. One of the nurses suggested that he will likely die soon after he is removed from the respirator, due to fluid which will accumulate in the lungs. A tracheotomy would facilitate removal of the fluid, but the nurse seemed to think that he should just be allowed to die. Please pray that Baby Andrew will have the strength to cough so that the tracheotomy is not necessary! By the way, Andrew has finally reached his due date! 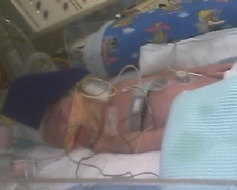 He was born about a month before his due date, so many of his problems have been related to his prematurity. Also, please pray for physical protection for Andrew's mom, Jessica. As a new Christian she is being faced with not only serious spiritual attacks but the threat of severe physical attacks from a "loved one." Thank you for praying! God has brought so many victories already in Andrew's young life! Yesterday Terri and I witnessed this little precious little miracle with our own eyes. Just two weeks earlier we had brought the prayer blankets to Andrew and anointed him in prayer as his limp body was connected to many machines. Yesterday when we saw him, he was crying, yawning, stretching... doing everything a normal baby does. The doctor who had said that he had less brain function than a rodent stopped by. Jessica (Andrew's mom) asked him to come look at Andrew. The doctor seemed kind of embarrassed when he learned that Andrew had been breathing on his own for over 24 hours (he hadn't thought that would have been possible). The doctor said "look me up when he's getting straight A's in school"! They may do another brain scan to try to understand what happened, because according to the previous brain scan he is not able to do what he is doing. God continues to demonstrate that He is not only baby Andrew's Creator, but He is also his Healer! 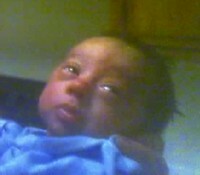 Baby Andrew has now been breathing on his own for a week and no longer is on any life support. He was moved out of the intensive care unit several days ago. He is still experiencing some seizures, so your continued prayers are still needed. Andrew's mother Jessica continues to give all of the glory to God for healing her son. He is expected to be released from the hospital this week. Baby Andrew had been home for about four days when this photograph was taken. Although the doctors had said that "if" he ever went home he would need a tracheotomy and a feeding tube, he was breathing and eating like a normal baby. The only special treatment he required was some oral seizure medication. We helped Jessica (Andrew's mom) to find an affordable apartment so that her living situation could be improved. She still needs some dressers and possibly a refrigerator and other furnishings. Praise God for healing Andrew and providing for the needs of his family! Terri was overcome by emotion as she marveled at the miraculous healing of baby Andrew during the prayer meeting. Jessica (at left), gives all the glory to God. Tonight we brought Andrew and his family to the Kern Region Prayer Watch meeting to encourage these intercessors who stood with Andrew in his darkest hours, and to request continued prayer that God will protect him and his family from the devil's schemes. Baby Andrew is just one of several people who have recently experienced God's healing touch through the prayers of these intercessors. Together we claimed Christ's victory not only over the devil's attacks against Andrew, but also over the entire abortion battle in Bakersfield. Listen in on part of the intercession and celebration.